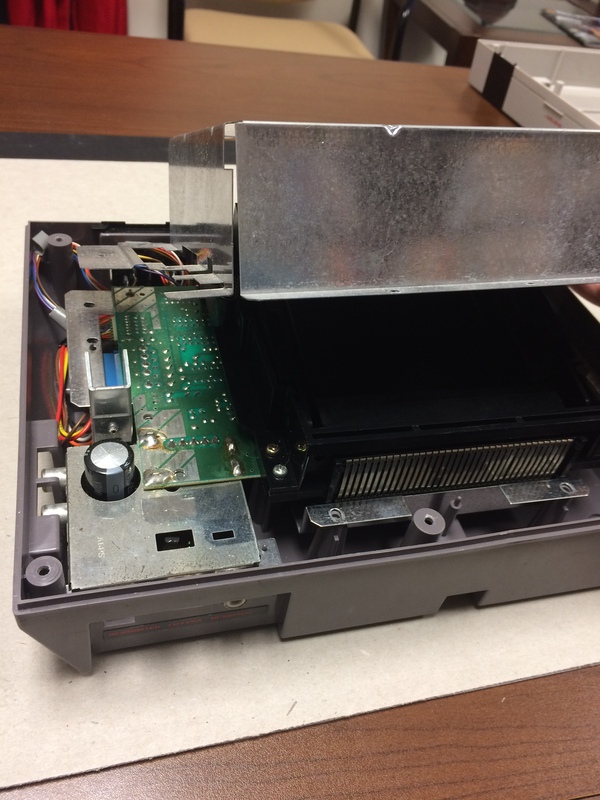 Like many others, I modified my original NES with a 47k resistor to support expanded audio playback. While connecting expansion pins 3 and 9 does access the additional channels, the balance is very inconsistent. 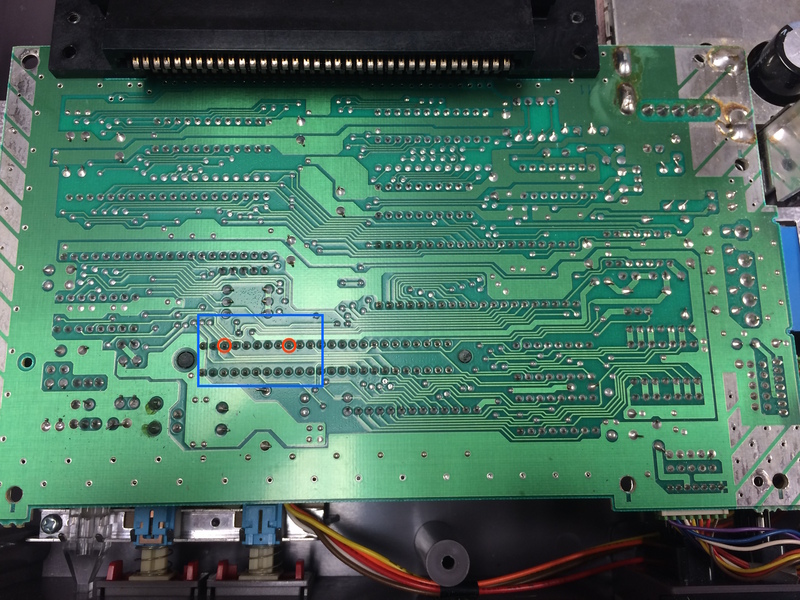 This is due to variability in the chips added to Famicom cartridges and to the Famicom Disk System and how they were mixed with the primary sound created in the console. Each expansion included both the additional audio data and the instructions for how it should be mixed with a Famicom. 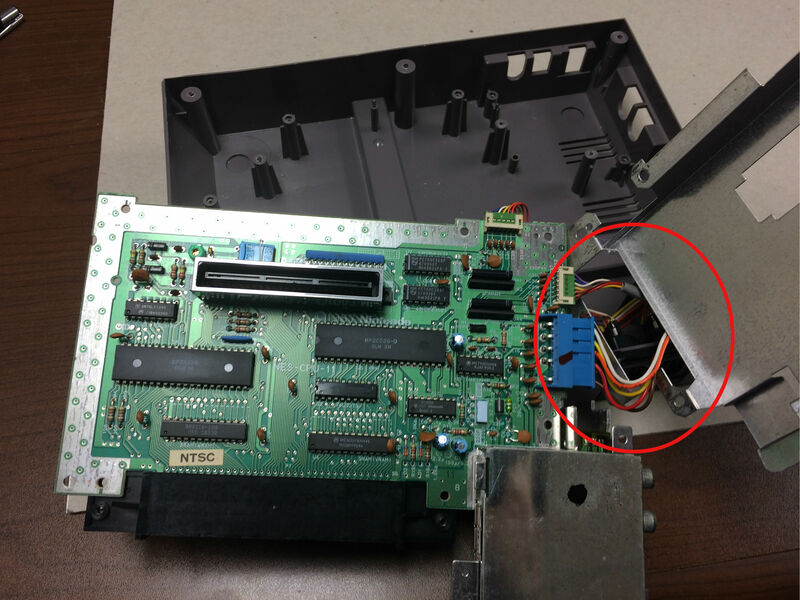 A fixed resistor therefore results in a fixed mix with the console. 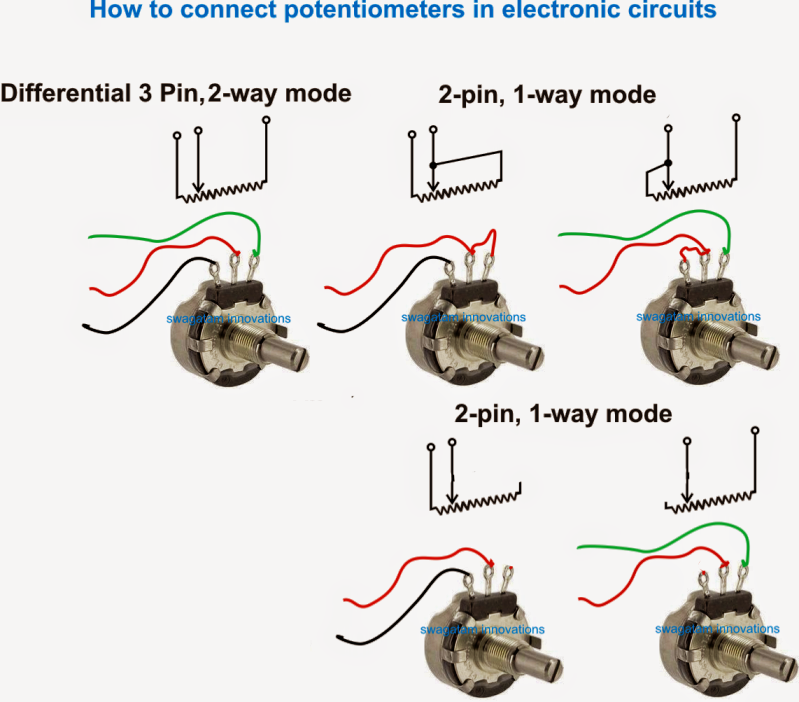 A potentiometer, used to vary the ratio of voltage divided between two circuits, can be wired as a variable resistor (i.e. rheostat) to provide dynamic control of the extra channels. 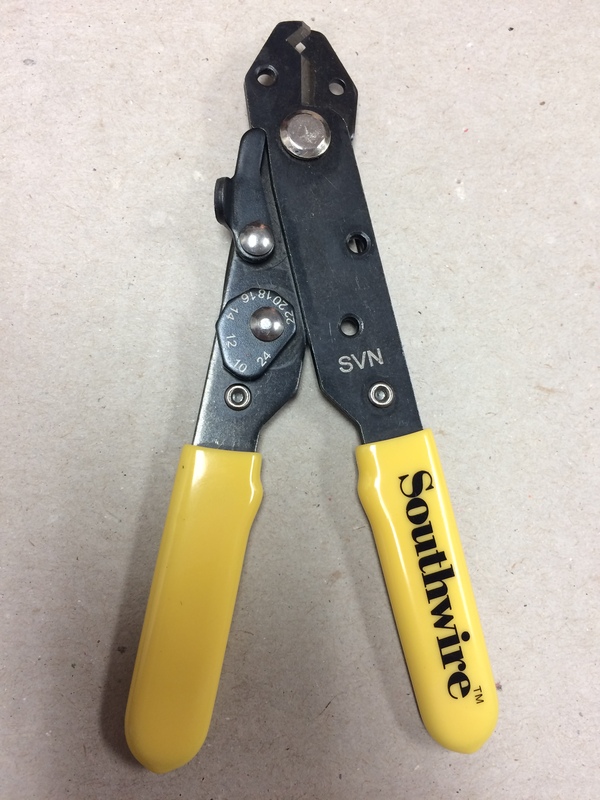 Instead of connecting all three pins, you just wire one of the outer terminal pins and the middle pin (wiper). I found this image helpful in demonstrating the difference. You could choose to bridge the extra terminal pin to complete the circuit in case the wiper should fail over time. 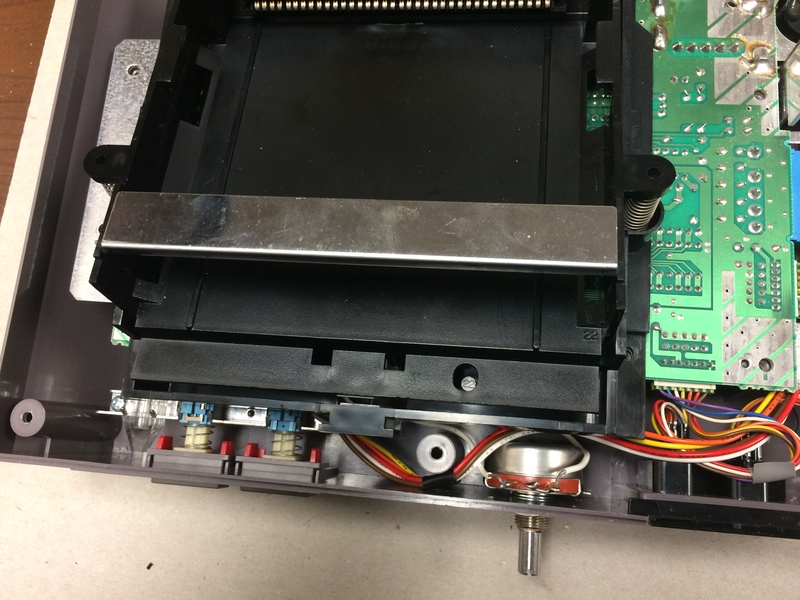 Since there were no visual guides specifically for a 100k pot mod to the NES, I decided to post my experience. I’m no expert, so I’m grateful for the post by Wesley Almond that guided me along the way. Also, thanks to Brad Smith (a.k.a. rainwarrior) for the 100k pot mod idea. 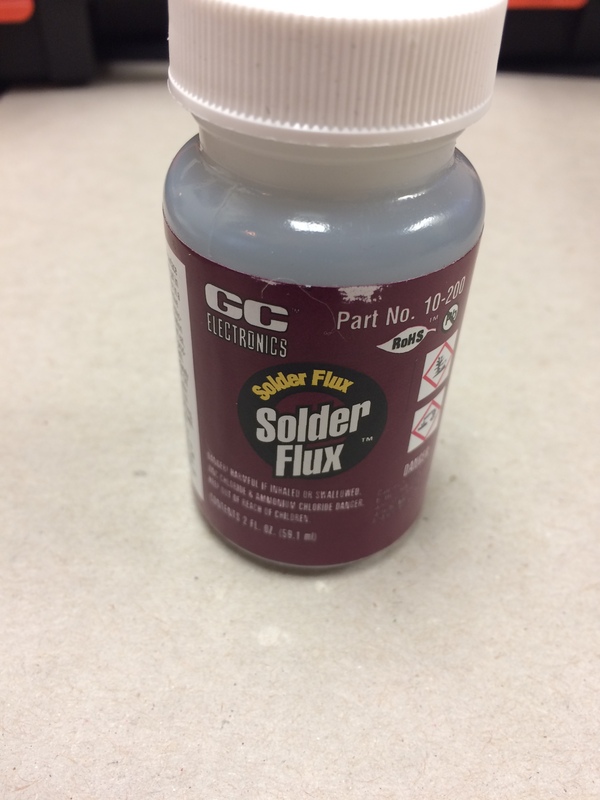 C)-coated, solid wire w/ small gauge. 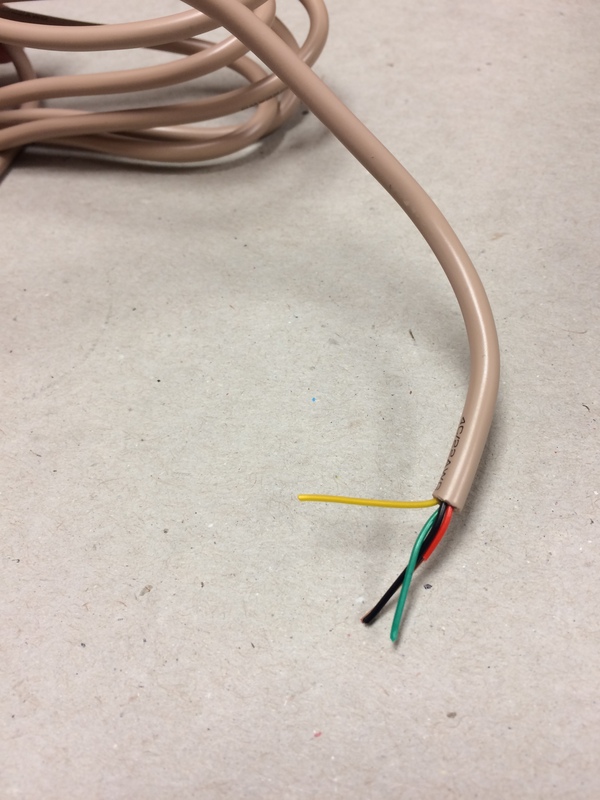 TIP: Have your local electronics shop sell you a few feet of 22 AWG/4 conductor security wire for practically nothing, strip, and choose among FOUR COLORS! 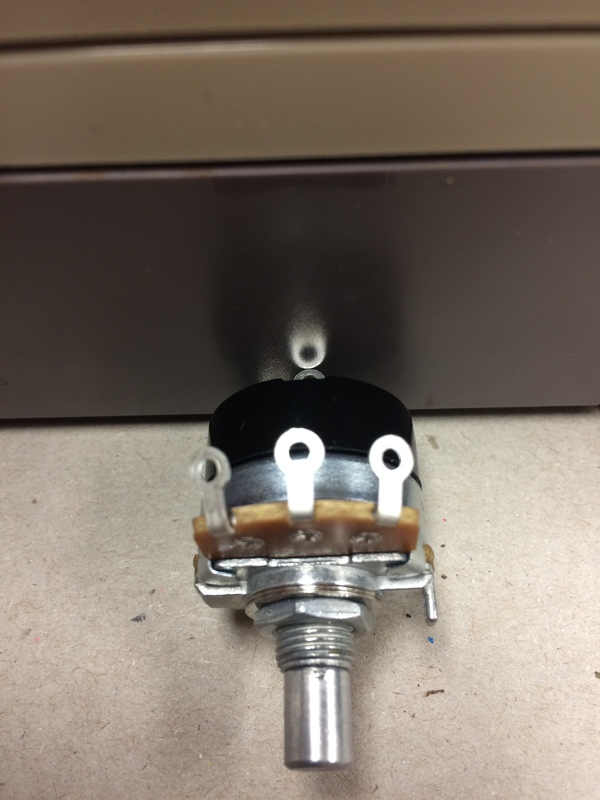 H)-100k Potentiometer. TIP: Some come with “off switch” that is engaged with a click when turned all the way, counter-clockwise. 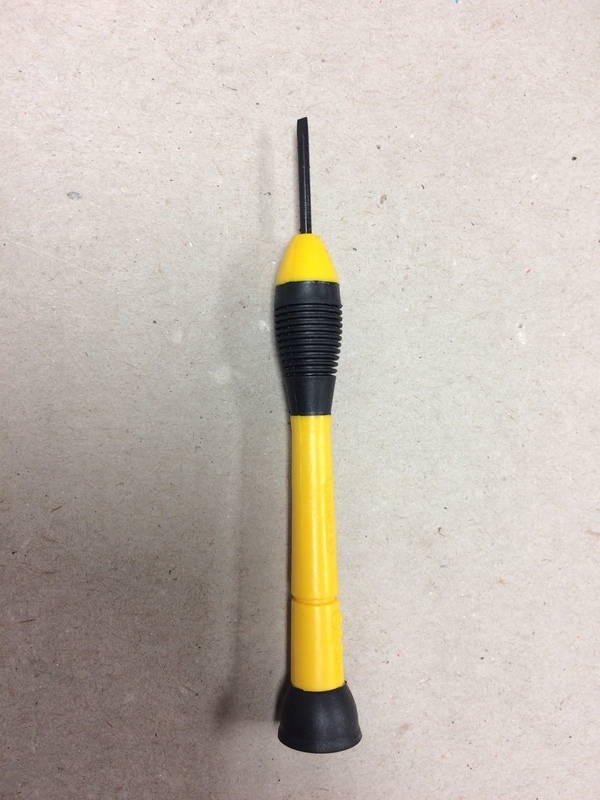 1-Remove the 6 outer casing screws with the philips head screwdriver. 2. Remove the bottom casing to reveal the heat shield. 3. Remove the 7 screws on the heat shield + the screws over the RCA and RF jacks. 5. 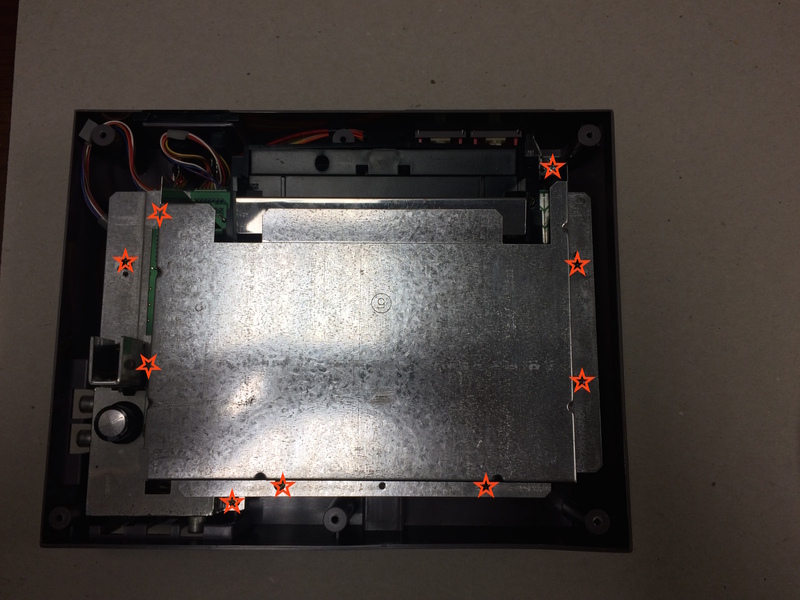 Remove the 6 screws from the cartridge tray. Note that the inner screws of the bottom pairs (blue) are slightly longer than the other screws. 6. 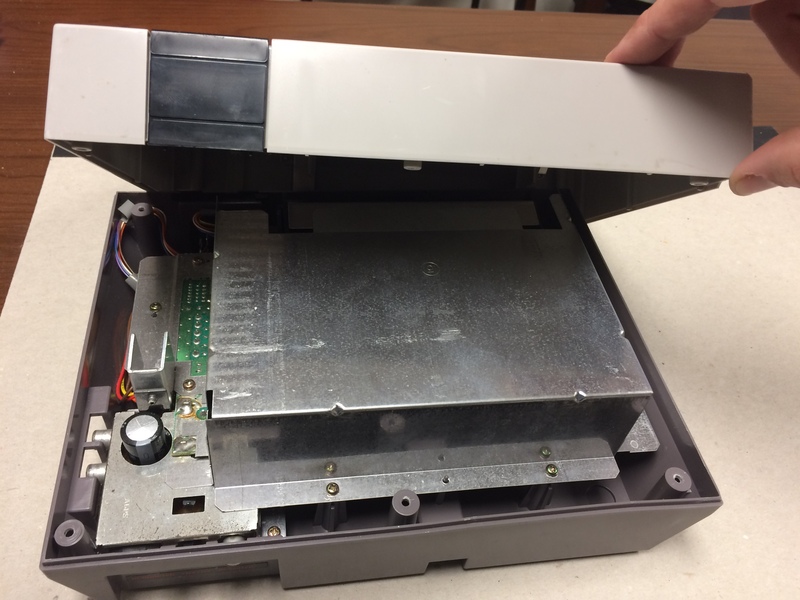 Pull the cartridge tray out and then lift up. 7. Slowly pull the board out and flip over gently around the course of wires. 8. 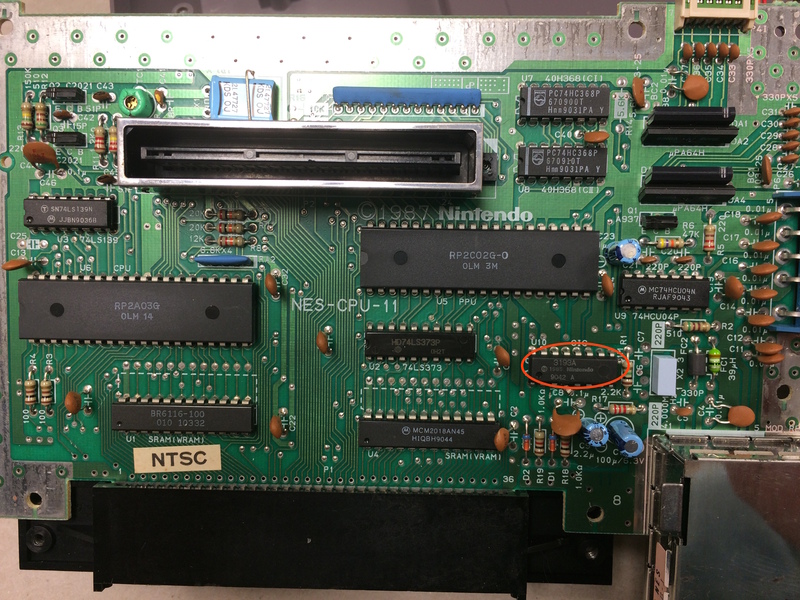 Locate the Nintendo lockout chip and pry off the 4th pin from the left—I used a jeweler’s flathead screwdriver to pop off and bend back. 9. 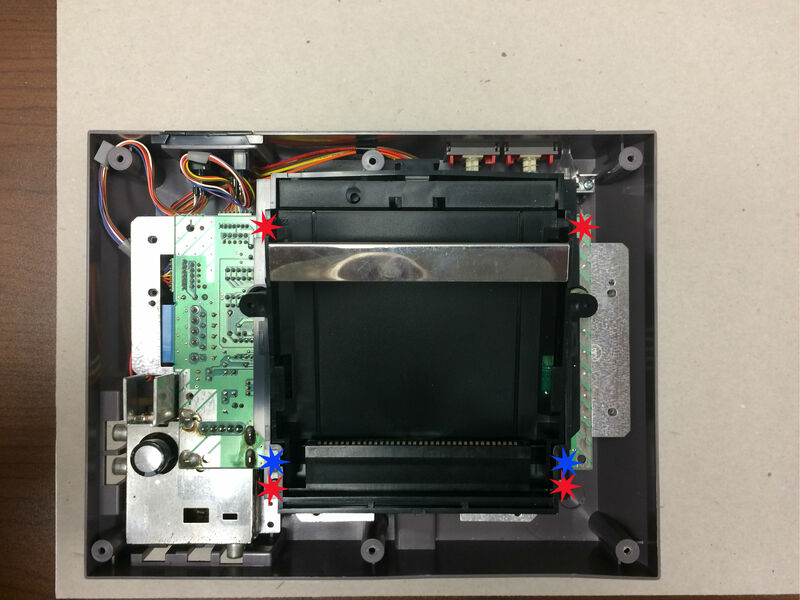 Slowly flip the board back over and set back into the console casing. 10. 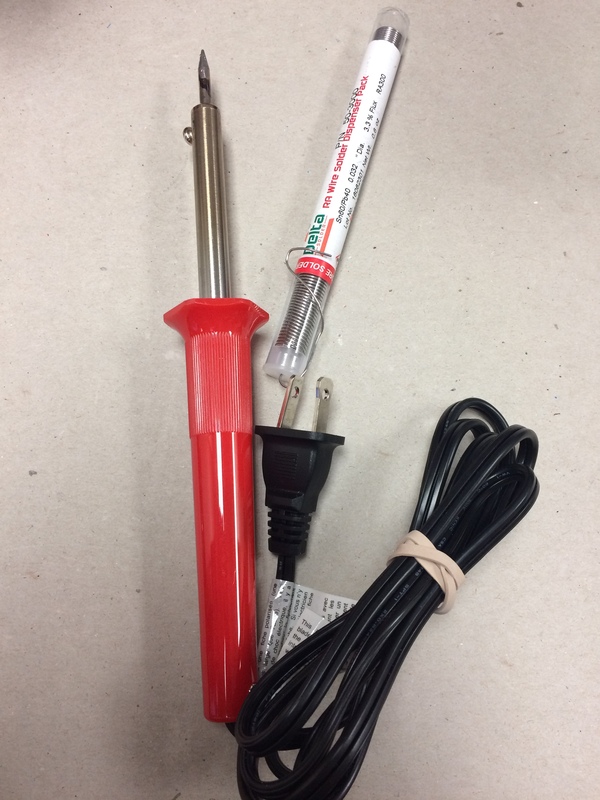 Prepare Pot: At this time, warm up and tin your soldering iron. Cut a pair of 5-6 inch wires and strip the coating back on both ends. 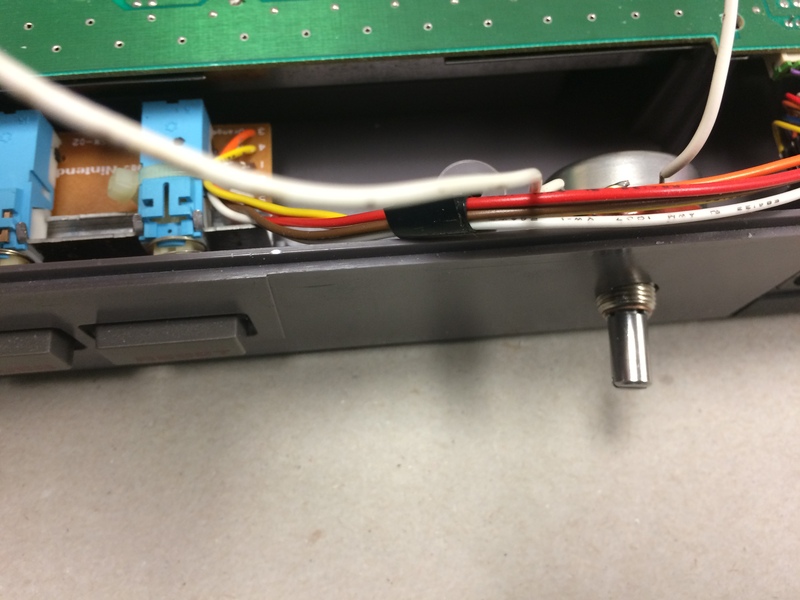 Warm wires with soldering iron, dip in flux, then warm solder with iron and connect one wire to the middle terminal on the pot, which controls the wiper, and the other to the right terminal on the pot. I shaped my wire like a hook and looped in the pot rings before applying solder. 11. 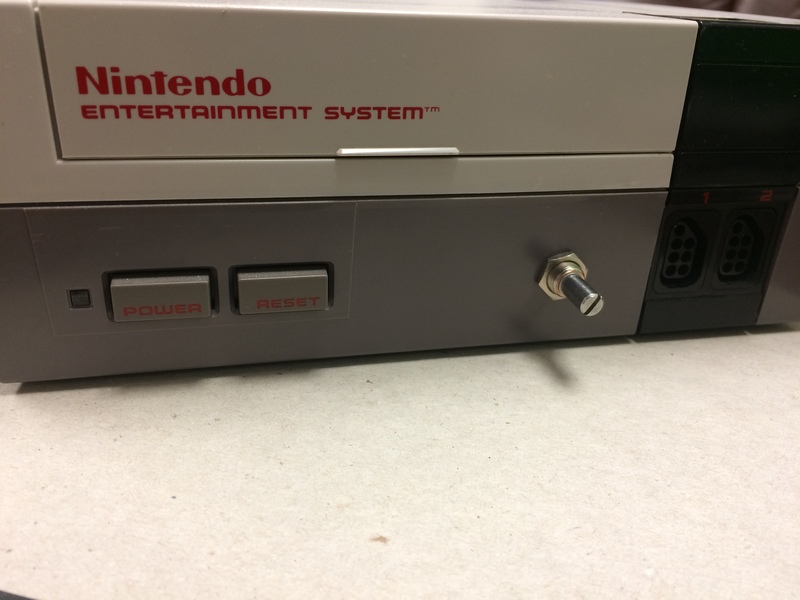 Once the pot has cooled, set it outside the console between the reset button and the controller jacks. 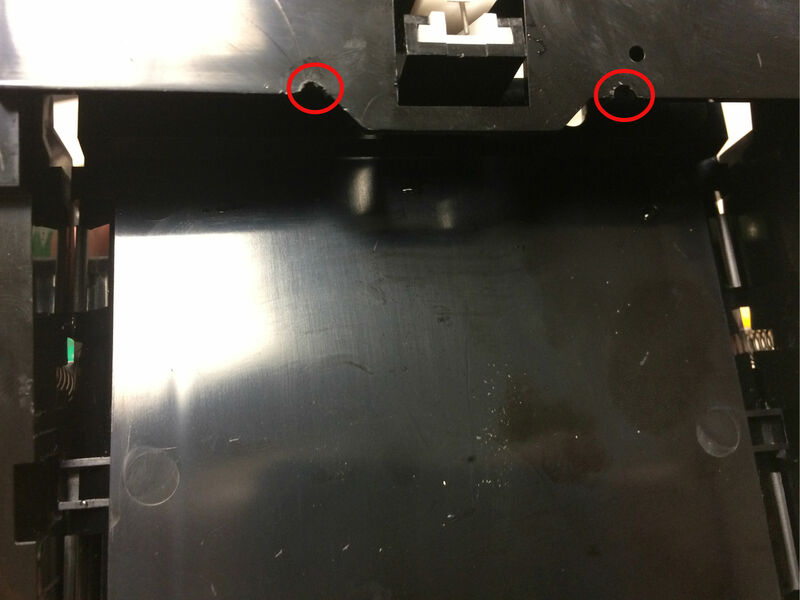 Mark your drilling location on the plastic casing where the pot knob will go, leaving enough clearance above the pot to reassemble the console. 12. Drill a small pilot hole and then use a 3/8 drill bit to create an opening for the threaded pot knob. Careful not to drill into the wiring, which can be pulled back slightly and even held out of the way with electrical tape if needed. 13. Apply some side pressure (or use a dremel) to widen the opening as needed until the threaded knob pulls through snug, and then fasten with the nut. 14. 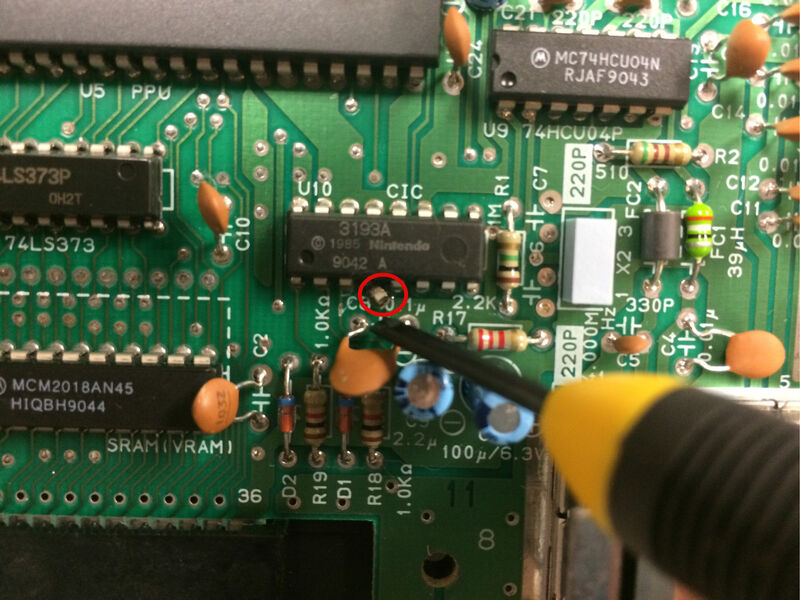 Locate pins 3 and 9 on the board, used to channel expanded audio. 15. Solder the wire attached to pot’s middle (wiper) terminal to pin 3 and the wire attached to the pot’s right terminal to pin 9. TIP: Make sure there is enough slack for the wire to run over the board and loop along the bottom of the casing before routing back up to the pot. 15. 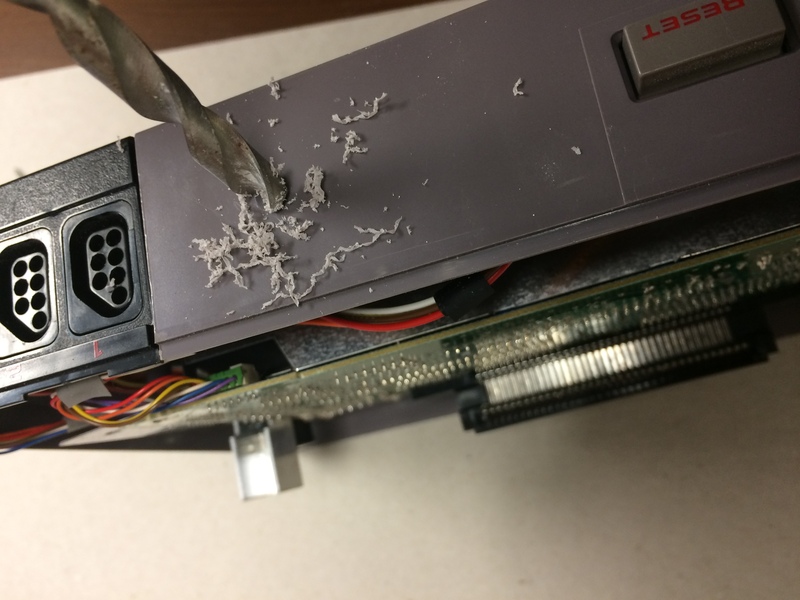 Use side of drill bit (or dremel if you have one) to carve out two small openings along the edge of the cartridge tray where the wire will not be pinched when pushing tray down during reassembly. 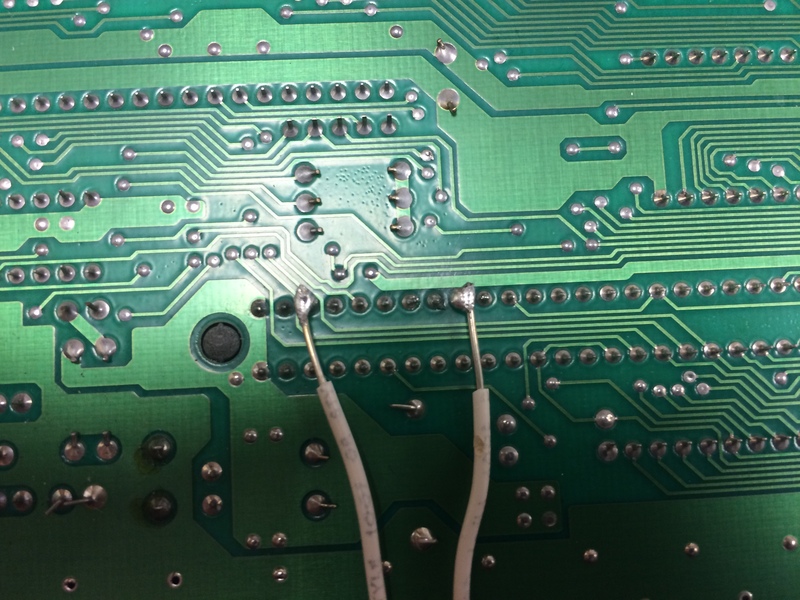 Alternatively, you could use longer wire and run completely around the tray and approach pins from the side. 16. 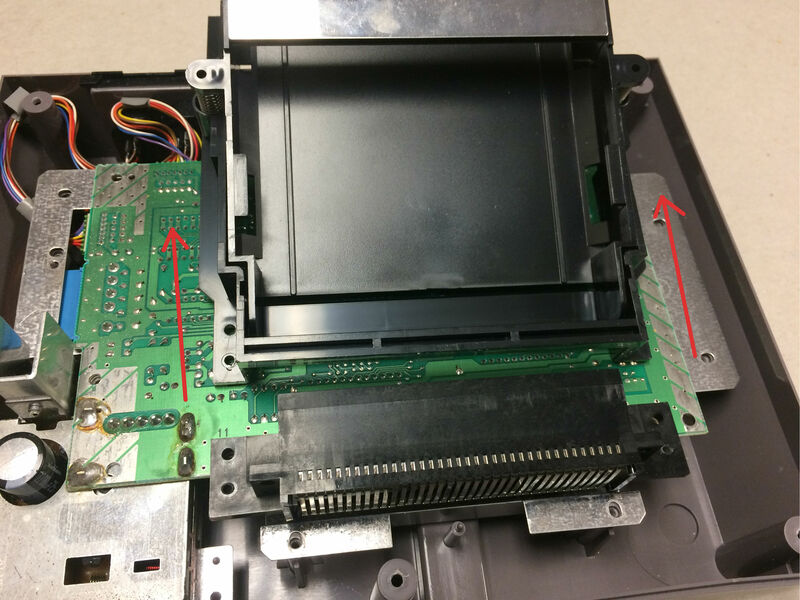 When reassembling the cartridge tray, make sure to slide the wires into the openings before pushing tray down. 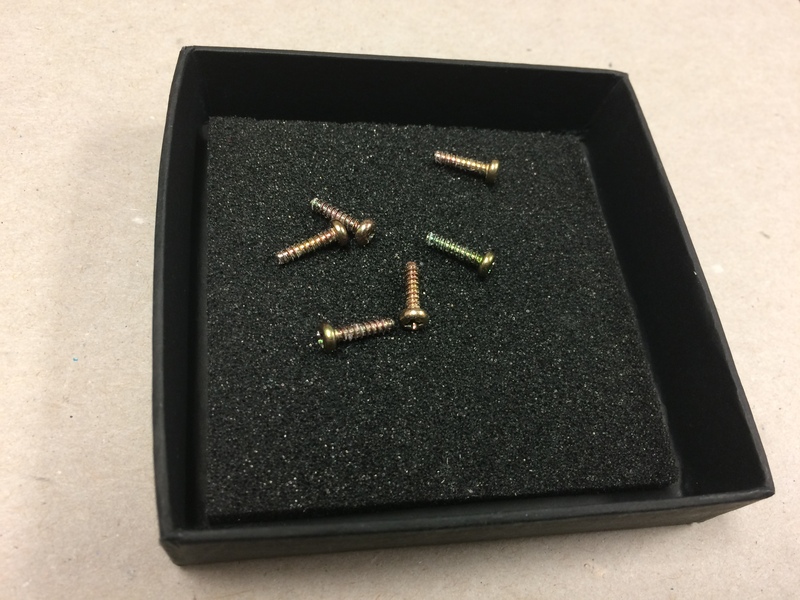 Also, remember to use the two longer screws in the correct locations. 17. Re-attach the heat shield and the bottom casing, and flip over. DONE! 18. 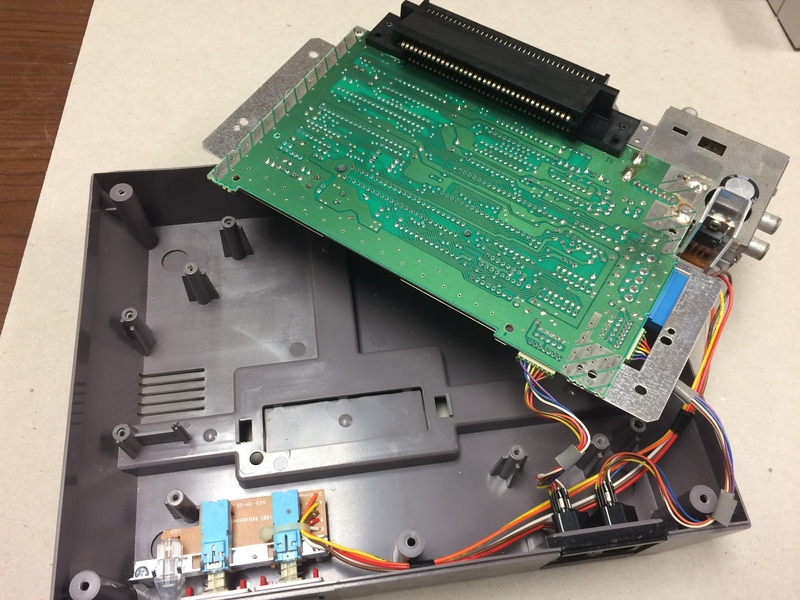 Test your modded NES! 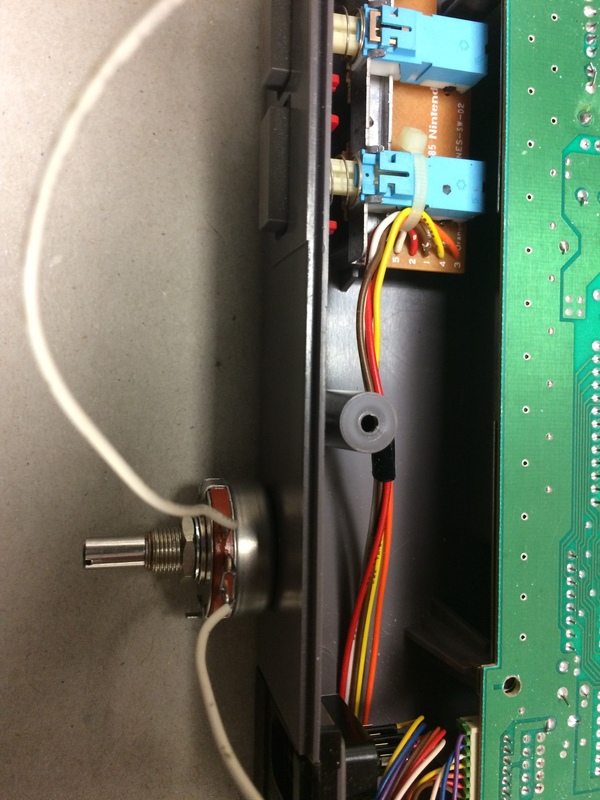 NOTE: This mod will not work with VRC7 (Lagrange Point) unless you are using an actual Lagrange Point cartridge, with the 60-to-72 pin adaptor wired to route the cartridge’s audio. Most other expanded audio will work via Powerpak flash cart. Use pot knob to mix expanded audio with console audio to your liking! Turn the pot knob off when not in use. Hope this helps newbies like myself! Please comment with any questions or feedback; if there’s a better way to do this, let me know and I’ll update!